So DIY is your bag? 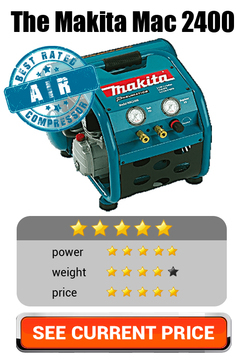 What better addition to your home maintenance capability could there be than a great quality air compressor? The compressor marketplace is filled with a wide selection of models and with vendors all vying for your hard-earned cash, it’s sometimes hard to work out what’s the best way to sort the contenders from the wannabes. 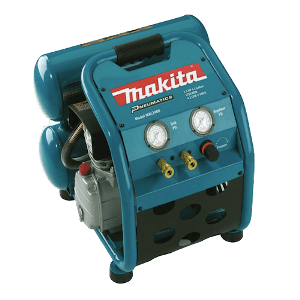 Choosing the type of air compressor to suit your needs can be a bit of a nightmare if you are new to the world of air tools. With so many models on offer, where do you start if you want to avoid an expensive purchasing mistake. We think it’s all about narrowing down your choices so we’d suggest three ways of beginning. Whatever else you think of, start by deciding what tasks your compressor will be helping you out with. Are you looking for help with the occasional flat tyre or pool inflatable or is it something more substantial such as nailing planks that need short bursts of high pressure? Look at the tools you plan to use and find out how much compressor oomph they need. These tools are rated in standard cubic feet per minute. Reading a spec sheet about anything can sometimes be a bit daunting and air compressors can take daunting to a new level. Look out for PSI or pounds per square inch. It’s a measure of compressors oomph and a good one should work comfortably at 90 PSI. Don’t forget to out for the standard cubic feet per minute (SCFM) this tells you a bit about the sort of tools a compressor will power. Look at your tools and check the required SCFM and multiply by 1.5 to get the SCFM rating you need. At first glance, air compressor types seem to be about food but that’s why we have second glances. Pancake air compressors are named after your favourite breakfast because the air tank is described as looking like a pancake. Well, nothing I’ve ever bought for a Maccie D breakfast looks like this but the relatively flat tanks on these compressors mean a compressor is lighter in weight and easy to store. Hot Dog compressors (see, more food) are called this after the shape of their tanks. They are often slightly larger and will drive a nail or staple guns. 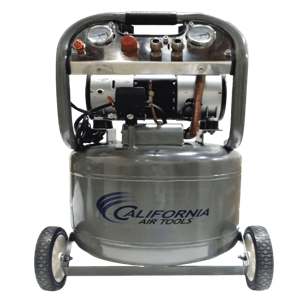 The problem with using an air compressor indoors is the noise so the California Air Tools CAT -10020 gets off to a great start – it’s a damn quiet air compressor. At 70 decibels it is quieter than the average conversation. Despite this, it has a two horsepower motor that keeps the noise down by powering two pistons to fill up the tank. 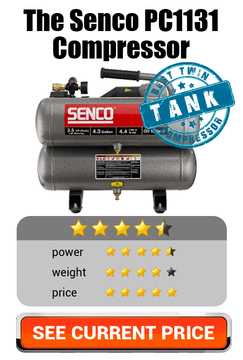 The Verdict: If you're looking for an air compressor to keep the peace, then look no further. At just 790dB, the CAT-100200 provides a weighty 10 gallons of compressed air that is enough to support most air driven tools that are needed at home. It would probably stop short at grinding and spraying applications but for most DIYers needs this compressor should suit. It even supports dual lines so when there’s a larger task on hand you can get it done twice as quick. 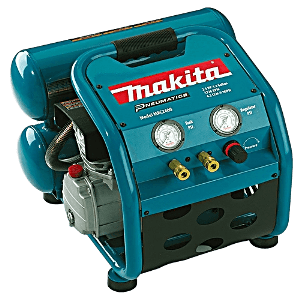 As soon as you see the up and over twin tanks you know you’ve got a real compressor on your hands with the Makita Mac 2400. Everything about this compressor says toughness and durability. The pump is made from cast iron (so the whole thing is a bit heavier than other models); it features a roll cage construction that protects the unit from bumps and knocks as you move it around and, of course, the twin tanks can store an impressive 4.2 gallons of compressed air. The motor is a 2.5 horse power motor that is particularly efficient, which means no hanging around for the tank to refill, it goes from empty to 130 PSI in 80 seconds but remarkably, due to its low amp draw it is unlikely to trip out your power supply every time the tanks needs a refill. The Verdict: For the more demanding home improvers, this solid and weighty compressor should prove a very reliable work mate. The excellent build quality means you can feel confident that you’ll be able to rely on the tank after tank of compressed air exactly when you need it and with just a little effort exactly where you need it as well. Pancake compressors are excellent choices for the home for a number of reasons. 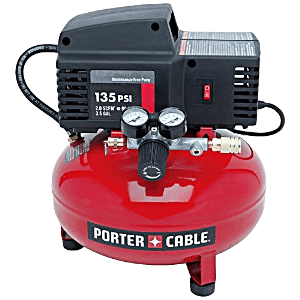 With the Porter Cable C2002-WK, you get a compressor that delivers 2.6 SCFM at 90 PSI, more than enough for most tasks around the home and home workshop. The motor quickly fills the six-gallon tank but most important of all, due to its compact design it has a small footprint so can be easily stored in a cupboard or under a workbench when not in use. Weighing in at just 34 pounds you don’t need to be an Olympic weightlifter to move it around the home, garden or garage where it can undertake a wide number of tasks. These days, life is all about accessorising and joy of joy this little beauty comes with a 13-piece accessory kit that includes a 25-foot hose, a tyre chuck, a blow gun and attachment, a tyre gauge, quick couplers, plugs and Teflon tape. Pardon – oh sorry, it’s BIT ON THE NOISY SIDE! The Verdict - All things considered, Porter-Cable C2002-WK is an ideal compressor for home use. Whether maintenance, light construction activity, or tidying up the garden leaves, it's a compressor that you can rely on: It's a small machine at a small machine price that will deliver large machine performance. 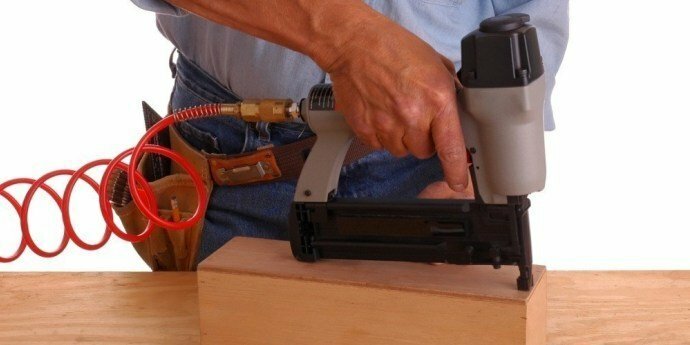 It doesn’t matter if you need a compressor simply for inflating tires, for fixing trim carpentry around your home, for building furniture or even for a full-blow home remodel – the above models are tried and trusted, and are hands down the best air compressors for home use.